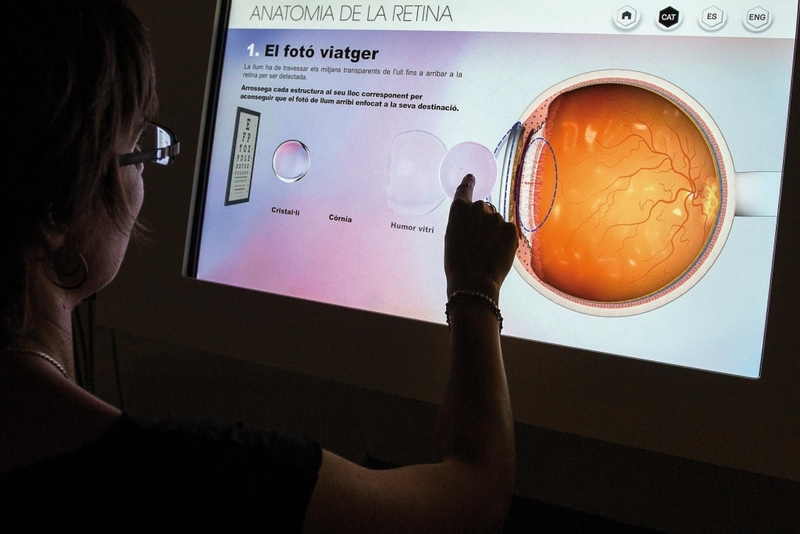 The BMF: Research for Vision and the Institut de la Màcula are stationed in CosmoCaixa Barcelona to raise awareness about the impact of degenerative diseases, and to give information about the lines of investigation that could help us to manage types of blindness that are currently incurable. 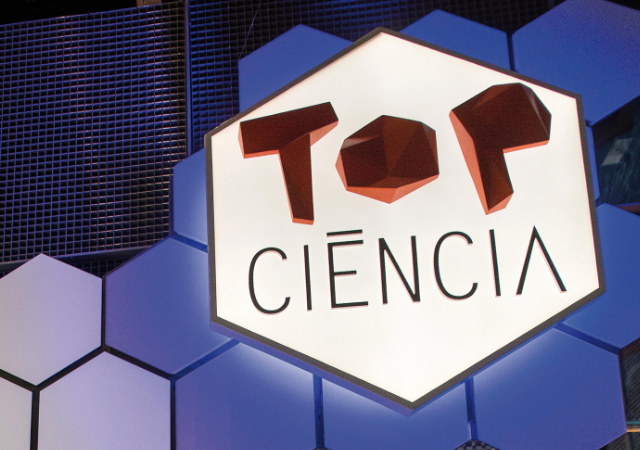 It is based in the Top Ciència area of CosmoCaixa, the area of the renowned centre of “la Caixa” Social Projects Foundation dedicated to the latest scientific developments. It is called Retina: New treatments for curing blindness. The BMF and the Institute de la Màcula have worked together to set up a space where the lines of research where both institutions stand out, linked to international research groups at the forefront of this field. The exhibition has different levels of depth. 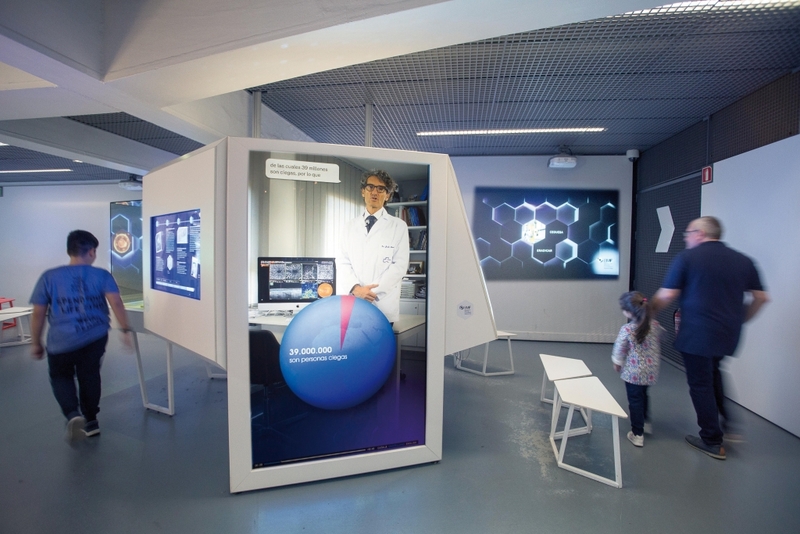 Through an enjoyable and largely interactive tour, people who visit this exhibition gain a broad view of the most advanced scientific research about the most common retinal diseases. The focus is on the whole world because blindness is a condition affecting millions of people around the world, from all cultures and conditions. Dr Monés welcomes you to this space. On a screen measuring almost two meters in height, the problem is introduced: in the world, there are 39 million blind people and 285 million with vision problems. From there, he notes the solutions explored in projects such as European-funded EYE-RISK project. He identifies the risk factors for AMD, a disease marked by genetic factors but also influenced by environmental and individual factors. He also highlights the involvement of the BMF and the IM in other projects on a continental scale, such as LITE, PRO4VIP and in the Catalan project Advance(cat). Does smoking increase the risk of blindness? This is one of the questions that will be answered if you continue along the proposed route in CosmoCaixa. The consumption of tobacco is, indeed, one of the individual factors which negatively affect the risk of AMD. 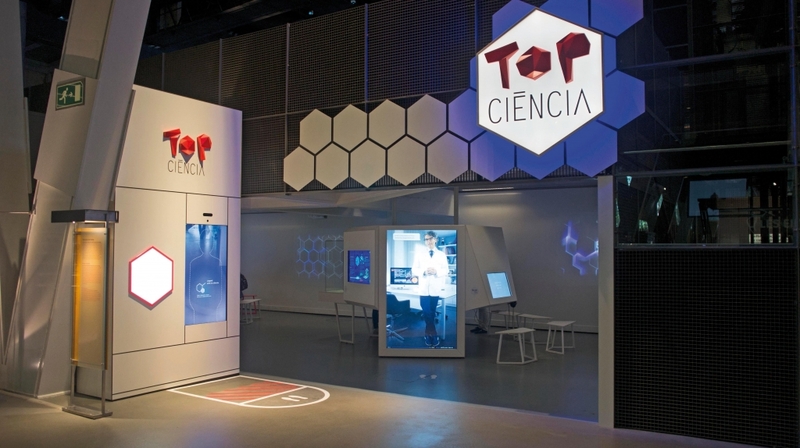 The interactive screen asks the questions and the system saves the answers so that, after answering, the visitors can compare their answers to those of other people who have previously visited Top Ciència. Nowadays, the greatest hope for managing incurable diseases, such as atrophic AMD, Stargardt disease or retinitis pigmentosa, is cell therapy. In the third stage of Retina: New treatments for curing blindness, Dr Monés transforms into a video game cartoon character and conducts research where he explains the principles being worked on towards cell therapy in the future. He brings us into the research to try to stop the diseases mentioned above. We will simulate a cell therapy process which, in this game, will be successful. We will differentiate induced pluripotent stem cells from retinal pigment epithelium and photoreceptors. With the application of these elements, we will stop the degeneration of the tissue. This is a procedure that researchers predict will be applicable in practice in the next decade. Educational dimension, playful dimension. 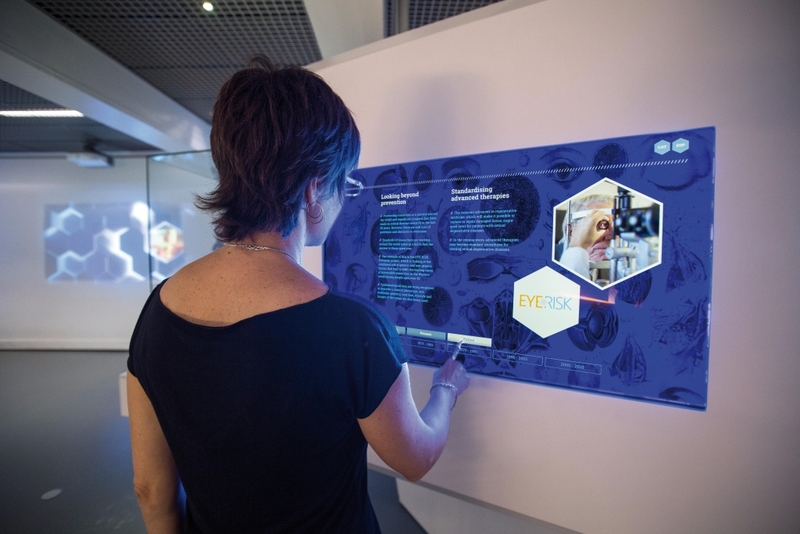 Retina: New treatments for curing blindness has three interactive stations which are suitable for different reading levels. 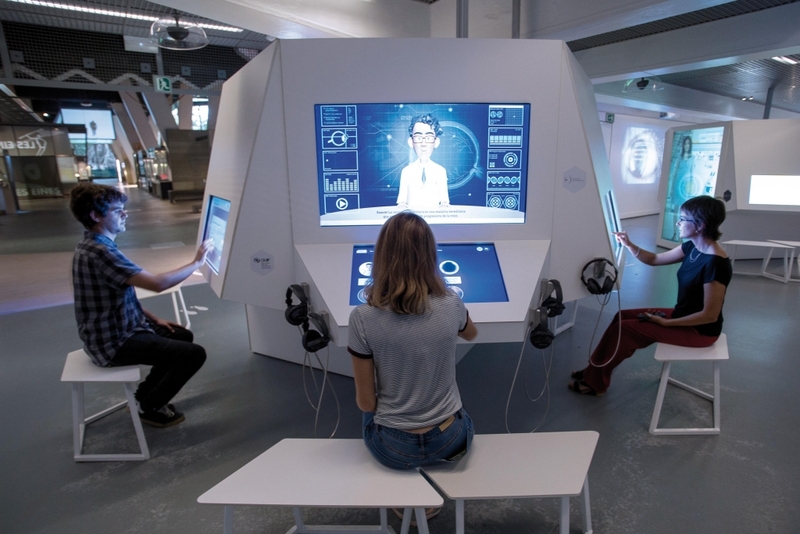 The next step in the exhibition explains the complex and precise mechanisms that allow the eye to recognise stimuli from the outside and transfer them to the brain so that they can be accurately decoded. With Dr Biarnés, the audio-visual guide delves into the key elements of vision through the organ of sight, and how some changes can leave it in the dark. The contents of Retina: New treatments for curing blindness have been developed using the experience of the IM and the BMF. Dr Monés, Dr Ferraro, Dr Biarnés, Eduardo Rodríguez and Anna Borrell have all contributed to this project. You can visit the exhibition in CosmoCaixa Barcelona until September 2018. Scientific Tour. The itinerary takes you through a review of the fundamental findings and advances in the history of ophthalmology. Privileged space. The exhibition occupies a prominent space in the entrance area of the Top Ciència section of CosmoCaixa Barcelona. Dr Monés’ Vision. The audio-visual presentation is led by Dr Monés, the head of the Institut of the Màcula and founder of the BMF: Research for Vision. The eye is in the centre. The exhibition puts special emphasis on explaining how the eye functions.